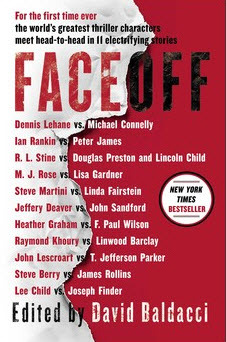 Simon & Schuster has announced plans to publish Face Off, a collection of thriller short stories. The collection will features story collaborations by 23 top thriller writers. The 11-story anthology will be curated by the International Thriller Writers (ITW). It will be published in 2014. The project will be edited by David Baldacci. The stories in Face Off will feature such pairings as Michael Connelly's Hieronymous "Harry" Bosch joining forces with Dennis Lehane's Patrick Kenzie in the story "Red Eye" and John Sandford's Lucas Davenport teaming up with Jeffery Deaver's Lincoln Rhyme in "Rhymes with Prey." David Baldacci said in a statement, "This is a once-in-a lifetime opportunity for readers. It's only through ITW that we were able to bring these literary legends toe to toe. I'm honored to be at the helm of this amazing ship."